Below are links to the 2017 Perpetual Folly Literary Magazine Rankings for Fiction, Poetry, and Non-Fiction. Scroll down for a discussion of the rationale and methodology behind the lists. If you find the lists useful, consider making a donation to support this site. Rationale for the rankings. Years ago, when I was first submitting short stories to literary magazines, I wanted a way to tier my submissions. I believe in simultaneous submissions, but I didn’t want to submit a story to a great magazine and a not-so-great magazine at the same time because of the risk of multiple acceptances. (If the not-so-great magazine accepted first, it would pain me to withdraw the story from the great magazine.) Developing a ranking of literary magazines allowed me to submit only to those magazines in roughly the same tier. I began sharing the list on my blog because I knew other writers used the same tiered approach to submissions. Eventually I added poetry and non-fiction rankings and also links to magazine websites. Basis for the rankings. I base the rankings on the annual Pushcart Prize anthology that comes out in November. That anthology includes fiction, poetry, and non-fiction and excludes the magazines of general circulation like The New Yorker, Atlantic, Harper’s, and so on. Other anthologies, like the Best American series and the O.Henry Prize Stories are excellent books, but their approach to assembling their winners is different. 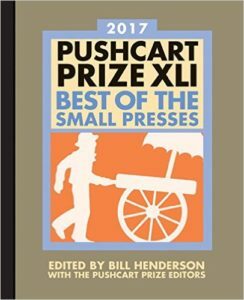 As these things go, the Pushcart Prize anthology draws from a wide range of nominating magazines, which makes it the best choice for these rankings. One criticism of the Pushcart Prizes is that they have a print-publication bias. Although there are an increasing number of online publications earning recognition in the anthology, that bias is probably real. There are some fine online magazines that won’t appear on these lists, unfortunately. Methodology. I’ve made a change this year. Originally, I based the rankings on a ten-year rolling score that assigned a constant value for Pushcart Prizes earned over that period and a lower value for Special Mentions. Some readers suggested that a five-year rolling score would be better because it would result in newer publications rising in the rankings sooner. But reputations take years to develop, and I didn’t like the shorter period, while acknowledging the validity of the point. So this year I’ve compromised. Now the formula assigns one value for Prizes and Special Mentions received in the most recent five years and half that value for Prizes received in the preceding five years. Symbols. You’ll notice a few symbols next to the names of some magazines on the lists. (c) indicates a closed magazine; (w) indicates a broken link for a live magazine; and (?) indicates some question about the magazine or an unknown link. ← The Rankings are coming, The Rankings are coming! Love your rankings, but I confess confusion: I don’t see what the numbers in the right columns represent. What does 55.5 for Conjunctions mean, for example? So, while I’m using the outright ranking (1, 2, 3, etc. ), I’m unable to draw value from the number in the far column because I can’t see anywhere what it means. Apologies if I’m missing it. Thanks for providing this list. Donation in December to follow! It’s obvious this list represents a lot of time and hard work! So happy to donate to that process, especially since, over the past several weeks, I’ve tapped this list often. Thanks again! Sorry for the confusion. The number in the right column is the score each magazine received according to the formula I use. The formula is explained in the Overview and takes into account all Pushcart Prizes and Special Mentions received during the last 10 years, the most recent five years being weighted more heavily than the preceding five years. With the score you can see how close a magazine came to being ranked higher. I see it now! (I scrolled back up and saw the language regarding Special Mentions, etc.) Thank you so much! First of all congrats on the great job you are doing here! Writers desperately need this kind of a ‘grading’, ‘ranking’, ‘weighing’ gauge. I have a question though: how about some newcomers like Needle, The Literary Hatchet, The Dark City, Thuglit, eFiction, etc? There are many fine magazines not included on the list, including the newcomers you name, simply because they have not yet received a Pushcart Prize or Special Mention, which is the sole criterion for being ranked here. Why Pushcart? That’s for published stories in books. More better would be the O. Henry awards, which is focused on magazines. The Pushcart Prize is almost entirely focused on literary magazines. You should take a look. It includes only a handful of pieces from published books. O.Henry is nice, but (a) it includes the “slicks” like New Yorker et al. that are out of reach for most people; and (b) it does not include non-fiction and poetry. Furthermore, I find the O.Henry selection process even more opaque than the Pushcart nomination/awards, so that’s the one I use. First, thank you for this resource! I point out the following fyi—not as a criticism as the burden of research and submission ultimately falls to the writer. Thanks for letting me know. When I’m aware that a market has closed I flag it with (c) to alert submitters. I’ll look into this and mark it as appropriate. If someone was nominated for a Pushcart by an online literary magazine (and a fine one) but it’s name doesn’t show up in the rankings can one surmise their essay was not given a special mention or selected? (I know the odds are long!) I see how the rankings are based on a rolling five year basis and this Lit mag is fairly new, maybe 5 years old maybe 3. The current rankings reflect prizes and special mention through the volume that came out in October 2016, which means it includes stories/essays/poems nominated prior to Dec. 1, 2015. Nominations made in 2016 are considered for prizes and special mentions that will be listed in the volume that comes out in October/November of this year, so they’ll be reflected in the 2018 rankings, which will be ready by the end of November of 2017. (In other words, if you were nominated in 2016, don’t give up hope.) I hope that answers your question. This is a valuable resource. Have you thought about normalizing by the number of stories each journal publishes? E.g., having a couple of Pushcart winners is more impressive if a journal publishes 10 stories a year than if it publishes 50. A practical barrier is that someone would have to look up how many stories each journal publishes. I don’t think this additional parameter–and yes, I’ve thought of it–would add much. Regardless of the number of stories (or poems or essays) a magazine publishes, it can nominate only six pieces in a year across the three genres. That complicates the matter further, but also levels the playing field when it comes to Pushcarts. Thank you very much! This is such a helpful list!! Be sure to check out the most recent rankings!